This article is a short summary of Advance Wars: Days of Ruin. Wars Wiki features a more in-depth article. 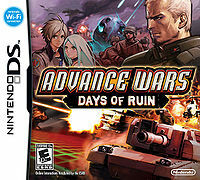 Advance Wars: Days of Ruin (Japanese: ), titled Advance Wars: Dark Conflict in Europe and Australia, is a game in the Advance Wars series. It succeeds Advance Wars: Dual Strike, although it does not exist within the same game canon. This page was last edited on 25 August 2014, at 00:03.